SEATTLE, WA (Jan. 24, 2019) — Duke’s Seafood & Chowder, serving sustainable seafood for more than four decades, today announces its 12 Days of Valentines with dinner and wine specials available from Feb. 7th – 18th. Recognizing the challenge and pressure typically associated with getting a reservation on Feb. 14th, Duke Moscrip, founder of Duke’s Seafood & Chowder, created the 12-day menu to allow everyone a chance to celebrate and, according to Moscrip, have no excuse not to. “Getting a reservation at a fine dining restaurant on Valentine’s Day is a tough hurdle,” Moscrip says. “So why not give couples more options? I created the 12 Days of Valentines at Duke’s so every couple that wants to celebrate in style has a chance to do that without worrying about making it happen on only one night. Plus, if there is one event to extend beyond one day, its Valentine’s Day; the day to celebrate relationships. Duke’s exclusive menu includes specials on its wide variety of Pacific Northwest wines as well as its artfully crafted cocktails. 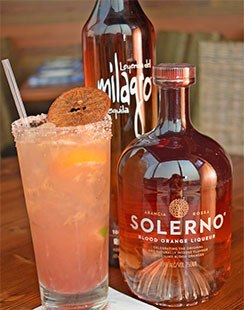 The featured cocktail, Blood Orange Margarita, handcrafted with Milagro 100% Agave Reposado tequila, Solerno Blood Orange liqueur, fresh lime and orange, homemade sour, red sugar and salted rim, on the rocks. For reservations or more information, visit the website at www.dukesseafood.com. Duke’s Seafood & Chowder began in Seattle, Washington in 1977 as Duke’s Bar & Grill. Founded by Duke Moscrip, the company now owns and operates seven restaurants in the Puget Sound area that focus on wild, sustainable, organic, hormone and antibiotic-free, and natural ingredients. Today it remains family owned and operated with son John Moscrip as a partner. Crafting the menu is long-time Executive Chef “Wild” Bill Ranniger, renowned for both his culinary skills and wild creativity. Beyond its four-decade history, Duke’s honors for its food and practices include three-time winner of The Seattle Chowder Cook-Off. A leading force in sustainable food, Duke’s received the highest seafood restaurant rating in the State of Washington by Fish2Fork and is among the first restaurants in Seattle recognized with a 100 percent volume compliance sustainable seafood rating from Smart Catch, a program designed to promote sustainability and raise consumer awareness regarding sustainable seafood options.